More acidic - protonated carbonyl or protonated hydroxyl? Consider two acetic acid derivatives, one with a protonated carbonyl oxygen and one with a protonated hydroxyl oxygen. This structure has a lone pair on its protonated hydroxyl oxygen and the oxygen is adjacent to an $sp^2$ carbon. Therefore we can draw an extreme resonance structure in which the hydroxyl oxygen has a +2 formal charge. No such "extreme" structure exists for the one with the protonated carbonyl oxygen. Now, we can definitely draw this resonance structure, but its contribution is likely very small and bordering on insignificant. I can't see how delocalization of electrons away from a highly electronegative, positively charged oxygen can help stabilize it. Therefore: Which is more acidic? The argument that the protonated hydroxyl one should be more acidic seems to be flawed at best. You have outlined the correct reasoning but drawn the wrong conclusion. The protonated carbonyl structure (top left) is stabilized by resonance (bottom left), giving two equivalent resonance structures. 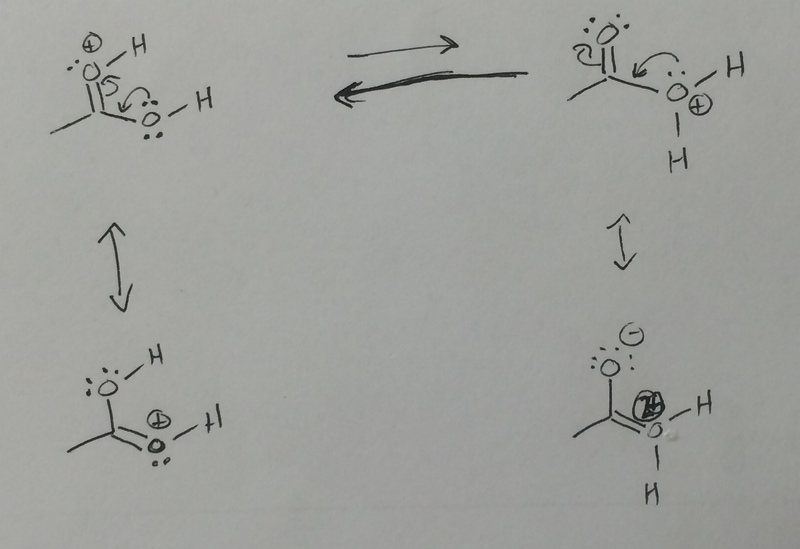 Although the protonated hydroxyl (top right) has a resonance structure that can be drawn (bottom right), it should be considered a negligible contributor since there is a double positive charge on a very electronegative atom that would be sp2 hybridized (also toss in the charge separation). Since the protonated hydroxyl is not stabilized by resonance, it is more acidic, i.e., it is more willing to give away the proton (and keep the electrons). According to this table, protonated ketones have a pKa of ~ -7.3, and the pKa of the hydronium ion is -1.76. I think the proper argument is that the electronegativity of oxygen in acetone is greater than in water. Why carboxylic group gets protonated preferantially on carbonyl oxygen? MgCl2 acidic or neutral in water? Why are amidines more basic than amines?